Fewer than one hundred double-barrel rifles are crafted annually throughout the world, while the number built in the .500 Nitro Express calibre is in single figures, guaranteeing exclusivity. William Evans ‘best-quality’ double-rifles have been used by generations of sportsmen and today the company is one of very few sporting arms manufacturers anywhere in the world, which retains the skills necessary to create a large-calibre sporting arm of this quality. Recognised as one of the finest of its kind for shooting big game, the double-rifle comes into its own when hunting dangerous quarry, where the ability to fire a second shot quickly and reliably can be vital. Since it was established in London during 1883 William Evans has developed an enviable reputation for high quality side-by-side and over-and-under shotguns, bolt-action and double rifles. Clients who prefer to deal with a relatively small, bespoke manufacturer which treats them as an individual, rather than being ‘just another customer’ walking through the door of one of the large ‘corporate’ gunmakers, appreciate William Evans’ exclusive service and craftsmanship. William Evans double rifles are manufactured to fulfil its clients’ wishes and are personally fitted for ease, speed and accuracy of mounting to the shoulder, on the line of sight. Creating perfection takes considerable time, this .500 Nitro Express sidelock ejector taking approximately three years from the order being placed to delivery, during which time it was made by hand, exclusively in England. Equipped with a bolstered back action, a classic sidelock double-rifle design feature which leaves more metal in the bar of the action for maximum strength, the gun features top-lever opening and a manual safety catch. Incorporating a rolled trigger guard, this stunning example of the gun maker’s art also has a double-trigger mechanism with an articulated front trigger. 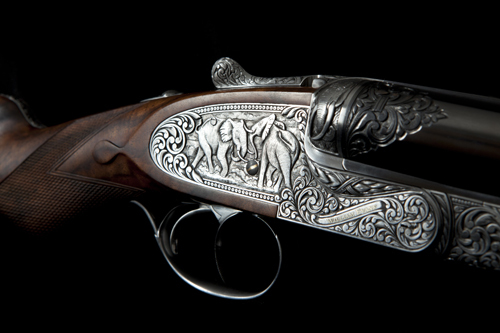 The action plates and body are entirely hand-engraved with scenes of African elephants, a theme inspired by previous William Evans double rifles. A key feature is that the engraving is in the ‘relief’ style, which creates a very distinctive two-dimensional effect that is heightened by the bright ‘coin’ type finish. The 23″ barrels fitted to this gun are shorter than the 26″ or 28″ barrels traditionally specified on large calibre rifles to reduce muzzle flip, but were chosen to allow faster, easier handling in thick undergrowth, an important consideration as most shooting of this type is done at 50 – 100 yards. The rifle also features a shallow V-type open rear sight incorporating gold inlay, together with a hooded muzzle sight with a flip-up moon-sight for use in low light conditions. To optimise accuracy and performance this rifle was ‘regulated’ for use with a 3″ Hornady cartridge carrying a 570-grain Hornady DGX (Dangerous Game eXpanding) bullet, a combination which generates 2150 feet per second and 5850 ft lb of energy at the muzzle. Although the rifle tips the scales at 11lb, the considerable recoil generated by.500 Nitro Express cartridge is such that the person firing it must have their weight firmly on the front foot to ensure they remain standing! A bespoke gun such as this is a very personal thing and the price paid for the privilege of owning such a stunning example of the gun maker’s art is necessarily high, reflecting the considerable time invested in it by artisan craftsmen. William Evans double-rifles start at £75,000 + VAT, but one such as this with exemplary engraving will cost considerably more. Offsetting the initial purchase price is the fact that over time top-quality sporting guns such as this generally prove a good investment.